Add mockups to JIRA issues. What is ProtoShare Mockups for JIRA? ProtoShare is the only interactive mockup tool available for JIRA. Quickly create, edit and view interactive mockups (not just static images or sketches) to visualize JIRA issues. 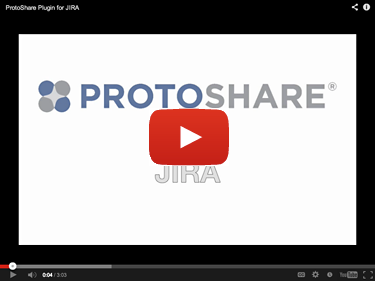 Interact with the designs within JIRA with ProtoShare's streamlined integration. Why use ProtoShare Mockups for JIRA? Visualize your requirements: Quickly create a visual representation of a user story, issue or solution. Create enough fidelity and interactivity so everyone really engages and understands the user story, issue or solution (which you can't do with a sketch). Make your point-quickly: From low fidelity wireframes to high-fidelity interactive prototypes, ProtoShare lets you get your point across, fast. Create a Shared Understanding: Create a shared understanding between UX, Business Analysts, Development and QA. Reduce Rework: Reduce up to 70% of rework through prototyping and visualization. Seamless Integration with JIRA: Seamless integration to enhance your existing JIRA workflows. Add interactive prototypes without rebuilding your process. Great for mobile development: Using ProtoShare's iOS, Android and Windows phone stencils and interactive states, create powerful mobile prototypes quickly in JIRA. Platform Support — ProtoShare for JIRA is supported for JIRA 5.1.4-6.0.3 on Macs, and on PCs running Windows 7, Vista and XP. Editing designs is supported in Chrome, Firefox (Mac or PC) and Safari 6+ (Mac Only). Viewing designs is supported in Chrome, Safari 5+, Firefox and IE 8+. We follow the basic JIRA pricing model, for an easy and straightforward purchasing process. ProtoShare Mockups for JIRA costs roughly half of what Confluence does.